... 1942, just shy of a year after the Japanese attack on Pearl Harbor drew the United States into World War II combat, the Casablanca premiered in New York City. 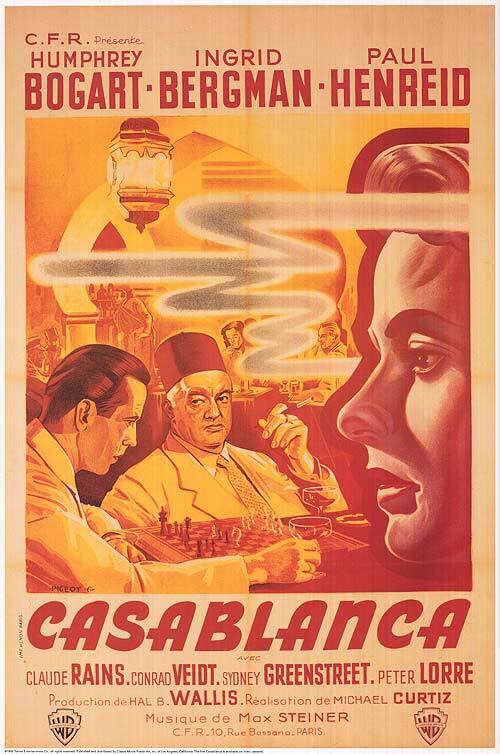 (movie poster credit) As had President Franklin Delano Roosevelt's January 1941 articulation of the "4 Freedoms," Casablanca, a story of love unrequited in a time when Nazis controlled Vichy North Africa, told Americans why the war was being fought: for freedom and against totalitarianism. The film went on to win Best Picture and 2 other Academy Awards, to contribute a host of "now-iconic quotes," and to become a timeless symbol of what sometimes is called America's "greatest generation."